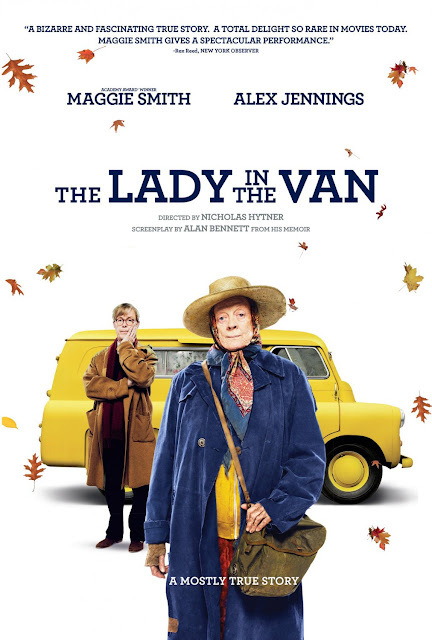 Movie: "The Lady in the Van"
After a traumatic experience, a woman known Miss Shepard (Maggie Smith) resorts to living in her van as a transient. She doesn't seem mentally all there. She forms an unlikely bond with a writer named Alan Bennett (Alex Jennings) who, after the local law is changed, making it illegal for her to park her van on the street, allows Miss Shepard to park her home/van in his driveway until she can sort things out. Based on the memoir of the real life Alan Bennett, "The Lady in the Van" is a sweetly humorous and touching film about a friendship between Alan, played by Alex Jennings, and a transient woman who goes by the name Miss Shepard, played by the incomparable Maggie Smith. Right off the bat, we have to say Maggie Smith is brilliantly excellent in this film. Her performance is nothing short of amazing as she shows both her dramatic and comedic range as Miss Shepard. This role earned her a Golden Globe nomination for Best Actress in a Comedy or Musical, and though she wasn't nominated elsewhere, her performance is certainly Oscar worthy in our opinions, especially considering there is another certain elderly woman nominated where she shouldn't be *cough* Charlotte Rampling *cough. * The character of Miss Shepard is rude, ungrateful, and a little crazy. She is often insufferable and berating, she never says sorry or thank you, and prays and participates in conversations with the lord constantly. However, in her bitter, rather insane state, she also manages to be charming and quite humorous. Maggie Smith brings a fine balance to the character of Miss Shepard, and we really couldn't see anyone else playing this part. It shows Smith still has many years left in acting, so long as her body complies. Alex Jennings is also great as the film's author Alan Bennett. He is often shown as two completely different people, which displays the two parts of his mind: the one who lives his life, and the one who records and embellishes it on paper. Bennett regularly talks to himself about what he is going to write, and he also narrates the story in a self-aware but totally literary fashion. These are some of the best parts of "The Lady in the Van" as we get to hear Jennings' snarky tone coupled with the decorated, elaborated language of his inner writer. Though Bennett's tepid demeanor takes a backseat to Smith's craziness, together, Smith and Jennings form a complete a yin and yang as characters. Their acting is wonderful when they are on screen together and separately, and all of this comes together to make a great, compelling character driven story. Unfortunately, "The Lady in the Van" is not without its flaws. The biggest drawback of the film comes from its pacing. This isn't a particularly long film, clocking in at just an hour and 44 minutes, but you wouldn't know it's that short because it feels a lot longer. There is a bit of a lull in the middle of it all, but in the grand scheme of things, the source material and performances are good enough to keep us engaged nearly the entire time. 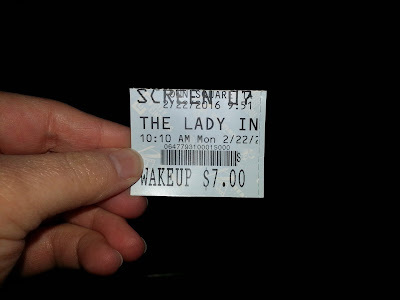 Overall, this film made us genuinely laugh a few times (especially at the very end! ), and apart from the minor length issue, the film provides for otherwise enjoyable experience. One year ago, we were watching: "Hot Tub Time Machine 2"